Despite growing to around 75cm in height this orchid is inconspicuous because the flowers as well as the leaves and stems are green and it blends perfectly with the grassy habitats where it is mainly found. 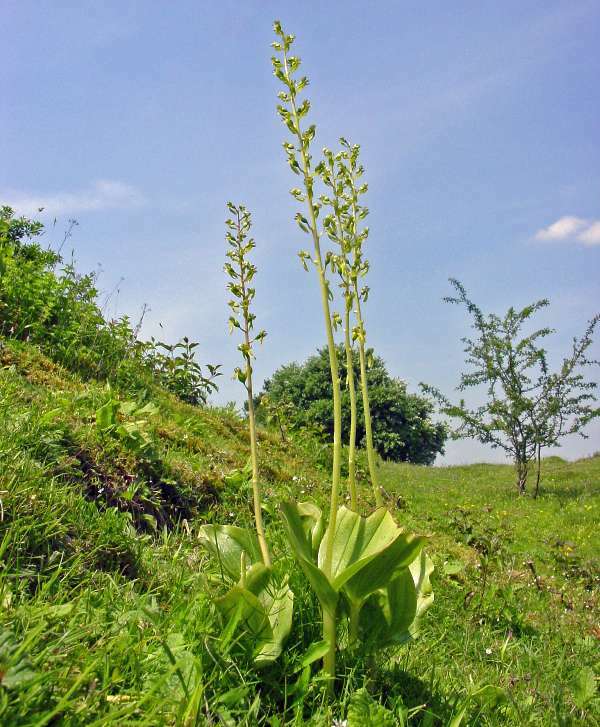 The name twayblade refers to the pair of oval leaves (two blades) near the base of the plant. The flower spike can have as many as 100 separate flowers. The specimens shown above were photographed in JUne at Noar Hill in Hampshire and at Kenfig National Nature Reserve in South Wales . 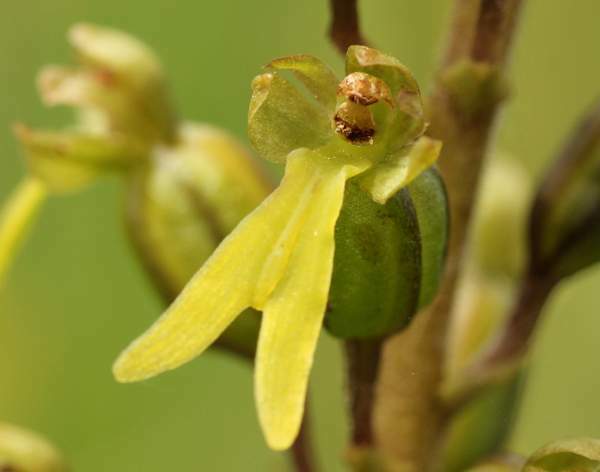 Previously better known as Listera ovata, this orchid is widespread but localised throughout the UK and Ireland. It is often found in large colonies, particularly in chalk grassland. In Wales the best places to see these common orchids are in the famous sand dune nature reserves which are dotted along the entire coast. 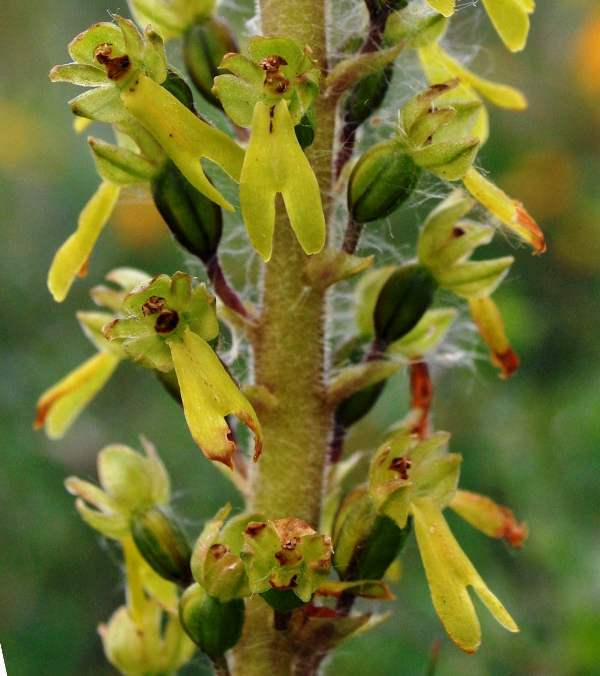 Kenfig, Dyfi and Newborough Warren National Nature Reserves are home to literally thousands of Common Twayblades, but be ready to be distracted by a whole host of other more colourful orchid species which occur at the same time. 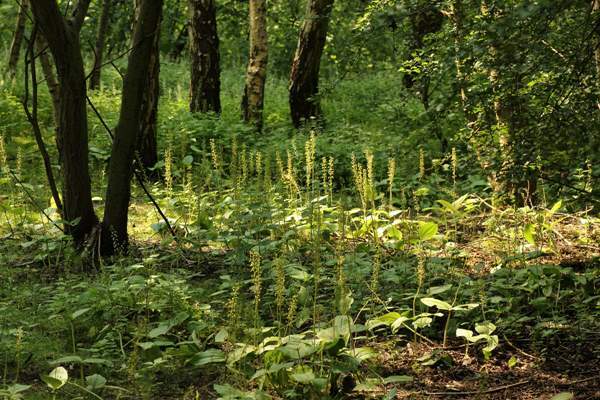 Common Twayblade grows in open woodland rides, on roadside verges and in grasslands. This orchid is predominantly a European species and occurs from as far north as Scandinavia to as far south as Crete and Sicily. We found and photographed many of these orchids during a visit to Slovenia in central Europe where Common Twayblades are found in the mountain meadows there and throughout the region. Mainly found in chalk grasslands but also occurs in open woodland and is occasionally found in slightly more acidic habitats. This page includes pictures kindly contributed by Elaine Hagget.